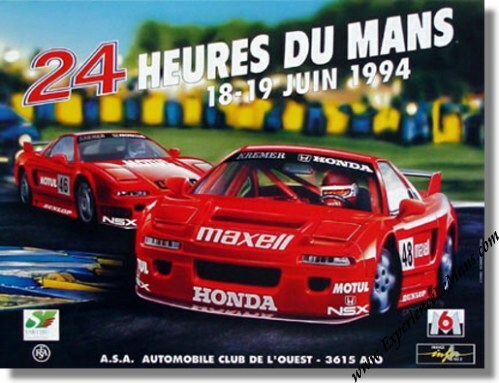 Original 1994 24 Hours of Le Mans Poster. The 1994 Le Mans poster is part of the "The star car used for sponsorship" era in Le Mans posters which lasted from 1981 to 1997. Design of the 1994 Le Mans poster was again in the hands of the S. Conseil agency and is based on a color illustration by Donnot. GT cars were rarely shown on Le Mans poster, with the main focus being on the prototypes, but this changed in 1994. The idea of a race-within-a-race was prominently featured. The logo of the Sarthe General Council, the new owners of the track, is also featured on the poster. The race was won by Yannick Dalmas, Hurley Haywood and Mauro Baldi in their # 36 Dauer Porsche 962 GT LM with a total of 344 laps to their name. For the full results of this race, please see 24 Heures du Mans results 1994.